Another news from Paraguay: The ‘Mercado Central de Abasto’ lies in the district San Pablo, of the capital Asunción. In its midst, a place named ‘Our Space’. The day care centre subsists for almost 15 years and for half of this time, the Lemonaid & ChariTea Foundation is proud to call itself their partner. For 6 years now, we have been updating our website with different news and pictures about one of the oldest projects we are funding. Lastly, through a short clip, which was shot in 2016 during one of our yearly project trips. 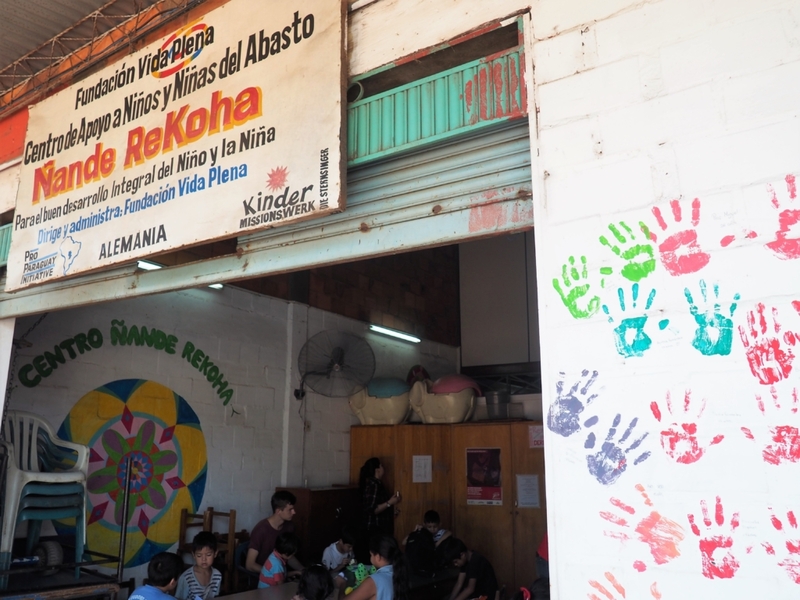 Obviously, our project coordinator Hanna and some Lemonaiders, again, went to visit the kids and teachers at ‘Ñande ReKoha’, during this year’s trip to Paraguay in October 2018. The day care centre is located within the central market Abasto and offers a place for communal studies, to play, to cook and to grow up, to children age 4 – 15. If you followed previous posts, you already know, that Ñande ReKoha is Guaraní – in addition to Spanish, the national language of Paraguay – and translates to ‘Our Space’. Founded and privately owned by Elisabeth Gavilan in 2004, the official sponsorship was transferred to the foundation ‘Vida Plena’ in 2008. In Paraguay, private institutions, as the one by Elisabeth Gavilan, obtain no state funding, whatsoever. Therefore, two additional German organisations started supporting the day care centre. One of those two also pointed the Lemonaid & ChariTea Foundation into the project’s direction. As a result, in 2011, a long lasting partnership between the ‘Pro Paraguay Initiative’ from Kempen in Germany and Vida Plena from Paraguay was initiated. Among Paraguay’s population, there are a lot of children. Therefore, the time kids spent in school during the day is shorter than in Germany. Some of the kids are taught in the morning, some of them are taught in the afternoon. Besides compulsory education in Paraguay, attending school on a daily basis is not as common. The situation at the central market Abasto is a perfect example. 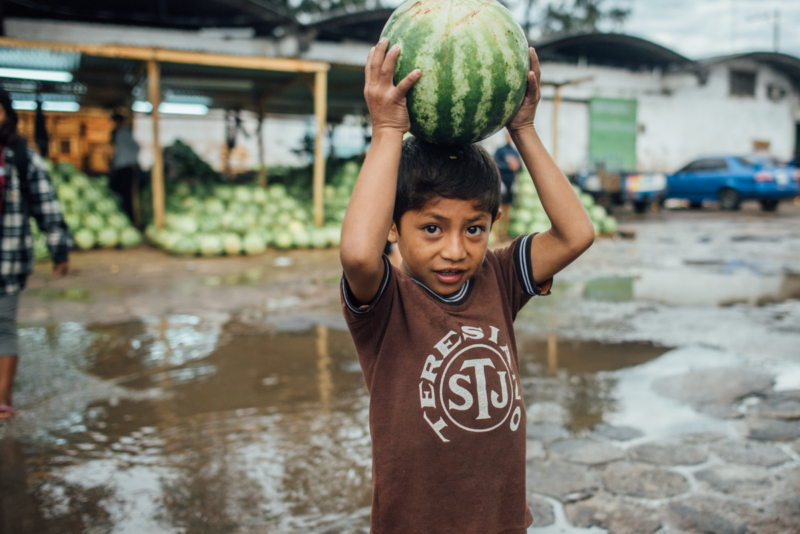 Regularly, kids have to help their parents selling crops at the market. The parents, whose children are not obligated to help, have no capability of taking care of their children. They have to trust them to go to school and stay out of trouble. In other families, education is not even important enough to talk about. And this is where the project Ñande ReKoha intervenes. It is a place for holistic day care. Together with the teachers, the children can do homework, play, laugh, learn and live. There are snack pauses in between; snacks, a couple of kids quite often prepared themselves. With various kinds of funding, the day care centre could evolve during the past 14 years. Now, there is a playground and space for playing football, a room for studying and doing homework as well as space for communal cooking and eating. They arrange trips or music projects and sometimes a teacher comes by, who dances together with the kids. The day care centre is more than an educational institution. It is a space for social contact. A space, in which children learn to act more autonomous, to work in a team and to treat each other with respect. They can discover talents and learn to use time and material, as well as the natural resources of their surroundings. Recently, they have established a small gardening project, which they use to keep the space clean and embellish it with different plants and flowers. According to the report we have received during the past years, an average of 140 different kids visit the centre yearly. Daily, it is about 40 kids. Those, who visit regularly or even daily, accomplish to obtain their secondary school qualifications, which is after 10thgrade. At this point, three other teachers work at the centre in addition to Daily. Regularly, they get support by one to three interns from Germany or other European countries. The centre aims to include the families in their children’s education through e.g. parent-teacher meetings. Furthermore, they try to elucidate the importance of the children’s education. 14 years are a long time, but still, there is much to do. Until the government takes over the financial responsibility for these kinds of institutions, the project is funded by organisations like Pro Paraguay or the Kindermissionswerk Aachen. The Lemonaid & ChariTea Foundation plays a part in the nutritional aspect of the project. The communal preparation and indulgence of food in the centre aims to educate the children about healthy and substantial food. Usually, meat, fast food and sugar are the main components of each meal, while having dinner or a meal with family is not very common. The funding by Lemonaid & ChariTea Foundation helps implementing the program for nutrition and health food. Soon, the day care centre can celebrate its 15thanniversary. Our 7-year-partnership with the centre is among the longest and was recently renewed for the following three years. Even more reason to look forward to a shared anniversary at the end of 2020.